Aside from Taito’s Elevator Action series, there’s not a whole lot of video games involving elevators as a main play point. But now there is with Lifty! Operate an elevator up and down as you pick up and drop off passengers to different floors. But it’s trickier than you think! Lifty! is available as a free-to-play download on iOS and Android mobile devices, but reviewed on iPad here. 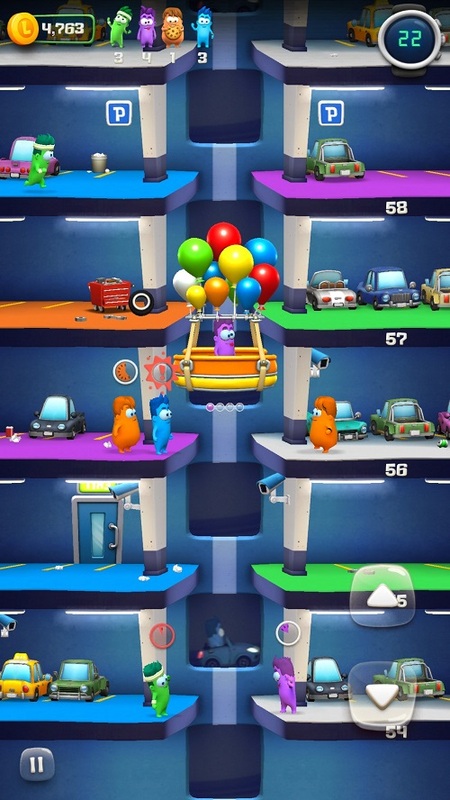 In the game you tap on virtual buttons on the touch screen to move your elevator up and down floors. On some floors, little critters will walk by and need a ride on the elevator. Pick them up and take them to the floor that has their same color, and then they’ll hop off. Pick up a certain amount of riders and drop them off to complete stages. You’ll want to get as high as you can in the building, and you start off in an underground mine, then a subway, a parking garage, etc. But there are some things you’ll need to watch out for. Your elevator can only carry a certain number of riders, and some have different weights than others. So if your elevator has a carrying capacity of 3, you can pick up 3 little blue guys or one big orange guy (counts as 2) and one blue guy. And if a critter gets to the edge and has to wait for your elevator, a little meter above his head will count down and if it runs out, they’ll get impatient and…EXPLODE! Let that happen three times and it’s Game Over. Along the way you can pick up power-ups that speed up your elevator and coins to buy checkpoints (more on that later). For 99 cents you can buy other elevators that have different speeds and carrying capacities. It’s really the free-to-play nature of this game that annoys me. After every level, you must view an ad, and they’re pretty long ones so that got a little old. You can spend money to keep ads from happening, though. I also wish the up and down buttons were a bit bigger, as I kept missing them with my thumb. By playing and completing levels, you can earn coins. Use those coins to buy checkpoints so you can start from there on your next playthrough. But that’s a bit counter-conducive to mobile games because if you have to stop for whatever reason and quit the game, next time you start it up, if you don’t buy a checkpoint you must start the whole game over from the bottom. And the game gets pretty hard, too! I love the simple gameplay and cute characters, but that checkpoint system really turned me off from this game. I think it would’ve been a better arcade title. So when your little elevator riders get impatient and explode, you can see bits and pieces of them flying, as well as their eyeballs. But that’s about as violent as it gets and it’s no worse than what happens to the coyote in the Road Runner cartoons. Reading skill is helpful for the text, and younger gamers may find it a bit difficult. Parental supervision is recommended for the in-game ads and purchases. Elelator go up, eletator stop. Elelator go down, eletator stop. If anyone can get that reference, you get a gold star from me.